She certainly had the looks. Along with a hubba-hubba figure, she possessed a great smile, alabaster skin and dark, curly hair. And she died right: young, mysteriously and gruesomely. Screaming headlines reporting her murder in 1947 warned of a “werewolf maniac,” as this city’s five newspapers sought to outscoop one another. Photos of her corpse — torso cut in two, face slashed into a hideous mock of a grin — were suppressed. But the nickname cinched it. It was derived from a popular movie of the day called “The Blue Dahlia,” starring Veronica Lake and Alan Ladd. 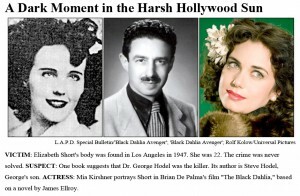 Short, who at the age of 22 stood out with her black clothing and her dark, sometimes flower-adorned hair, was known to friends as the Black Dahlia. Obsession has surrounded Short’s murder from the beginning, as a roll call of confessors — there were dozens — stepped forward, claiming they had done the Dahlia in. But to this day the case has not been solved, further adding to the lore. Now, nearly six decades after her death, Universal Pictures is preparing to release “The Black Dahlia,” based on James Ellroy’s 1987 novel of the same title, giving Short her first big-screen close-up. Directed by Brian De Palma and budgeted at about $45 million, the film will reach theaters in the fall, with a cast that includes Josh Hartnett, Aaron Eckhart, Scarlett Johansson, Hilary Swank and, as the mysterious title lady, Mia Kirshner. In The Black Dahlia, Mr. Ellroy fictionalized Short in much the same way he transformed real-life characters in his book turned film “L.A. 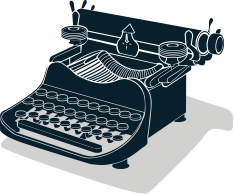 Confidential,” using her murder to propel the novel’s many twists and turns. “I was interested in art and theme,” Mr. Ellroy said, rather than in solving the actual case. Mr. Ellroy, who was drawn to the Dahlia case as a child through the Jack Webb book The Badge, also became fixated, in large part, because his own mother was murdered when he was 10. “Elizabeth Short and my mother kind of merged,” he said. This much appears to be settled: Elizabeth Short grew up in Medford, Mass., as a free-spirited girl who enjoyed being noticed — and being different. According to reports filed by investigators, Short spent the last five months of her life moving from place to place — at least 11 different residences. One report said “the victim knew at least 50 men at the time of her death.” Frequently spotted on Hollywood Boulevard, and in the company of servicemen, she was not a prostitute. But she was adept at charming men into picking up her tabs. It was a married salesman who dropped her off at the Biltmore Hotel in downtown Los Angeles, at approximately 10 p.m. on Jan. 9, 1947. Officers arrived and found a naked body that had been expertly bisected and drained of blood. The two halves appeared to have been carefully posed, and the victim’s face had been slashed so that the mouth was extended into an eerie smile. There were rope marks on her wrists and ankles, indicating she had been restrained, and other signs of torture. Many theories have emerged about Short’s killing. Were Bugsy Siegel and the mob involved? A drifter named Jack Anderson Wilson? In one book, a former police detective named Steve Hodel posits that his own father, Dr. George Hodel, was the murderer. Meanwhile, Larry Harnisch, a Los Angeles Times copy editor, has been digging through files, speaking with members of the press-shy Short family and working toward his own hypothesis (and planned book): that the killer was a surgeon named Walter Bayley. It was Mr. Harnisch who cataloged the case files that the Los Angeles County district attorney’s office only recently made available to researchers. As for all the theories, “We aren’t taking any official stance,” he said. Given its horrific nature and mysterious circumstances, the Dahlia case continues to resonate culturally. Imagery of the case derived from Mr. Ellroy’s writings inspired the jazz composer and saxophonist Bob Belden to write the 12-part musical suite “Black Dahlia.” (Heavy metal has offered up its own homage: a group called the Black Dahlia Murder.) And last year, a Bay Area artist, Hailey Ashcraft, was curator of a multimedia exhibition that explored the mystique surrounding Elizabeth Short. Among the pieces was a photograph of a vacant lot with two abandoned couches.